* Selected with the fifth overall pick by the Boston Breakers in 2013 NWSL Draft. * NSCAA Scholar All-American Second Team (2012). * NSCAA South Scholar All-Region First Team (2010 & 2012). * Capital One/CoSIDA Academic All-District IV First Team (2012). * Lowe’s Senior Class Award Watch List (2011). * All-ACC Second Team (2010 & 2012). * NSCAA Southeast All-Region First Team (2012). * All-ACC Freshman Team (2008). * Soccer America Freshman All-American Second Team (2008). * Soccer Buzz Southeast Region All-Freshman Team (2008). * Weekly Honor: TopDrawerSoccer Team of the Week (9/17/12). * Tied for first in career assists in ACC play with 11. * All-ACC Academic Team (2010). * Four-time ACC Academic Honor Roll honoree (2008-09, 2009-10, 2010-11, 2011-12). * FSU’s President’s List (Fall of 2011, Spring 2012). * FSU’s Dean’s List (Fall 2008, Spring 2009, Fall 2009, Spring 2010, Fall 2010, Spring 2011). * Leaves Florida State tied for the school record in assists in ACC games at 11 with Tiffany McCarty. * Made the move to defender playing as the Seminoles’ outside left back in 23 games during her senior campaign…also saw playing time as a forward and midfielder in her first three seasons. * Finished third on the team in minutes played with 2056 – the most minutes played over her four-year playing career at Florida State…played every minute in 21 of the 23 games she started. * Key component of the Seminole defense that set school records for shutouts (17), GAA (0.62) and fewest goals allowed in ACC play (4), while tying the program record for the fewest goals allowed in a season with 15. * Seminole defense ranked in the top 40 nationally in shutout percentage (2nd – 0.708), GAA (12th – 0.619) and save percentage (36th – 0.839). * Helped FSU string together nine straight shutouts – a school record and tied for the 13th longest streak in NCAA history – and a consecutive minute shutout streak that last 934:09 (school record). * The Seminoles blanked their first eight ACC opponents en route to claiming the conference regular season title for the second time in school history. * Tallied four points on four assists while registering 16 shots including five shots on goal. * Two of her four assists were game-winners…first assist came on the road at NC State as she reversed the field on a great cross which led to a goal by Dagny Brynjarsdottir. * Second game-winning assist came in the second round of the NCAA Tournament as she found Tiffany McCarty for the golden goal in double overtime to help Florida State defeat Texas Tech. * Put together a streak of three straight games with an assist – all coming in the postseason – one in the ACC Tournament semifinals against Virginia and two in the NCAA Tournament. * Recorded a season-high three shots against the College of Charleston. * Started all five games in the NCAA Tournament…finished with two points on two assists. * Registered two shots in FSU’s semifinal match-up against Penn State. * Received a redshirt after suffering a season ending injury during the preseason. * One of a school record seven Seminoles named to the All-ACC first or second teams. * Also one of a school record seven Seminoles named to the ACC Academic Team. * One of six Seminoles to start every game during the regular season and NCAA Tournament. * Tallied 1839 minutes on the pitch, which was the fourth most of any Seminole. * Ranked third on the team in shots (38), shots on goal (18) and goals (5). * Finished the season fourth on the team in assists (3). * Recorded season-highs in points (13) and goals with five. * Led Florida State in the season opener vs. Washington State with four shots including three shots on goal. * Scored her first goal of the 2010 season in the 6-0 victory over Stetson victory. * Tallied two multi-goal games on the year scoring twice at NC State and against Middle Tennessee State in the first round of the NCAA Tournament. * One of her two goals against NC State went down as the game-winner her only GWG of the season. 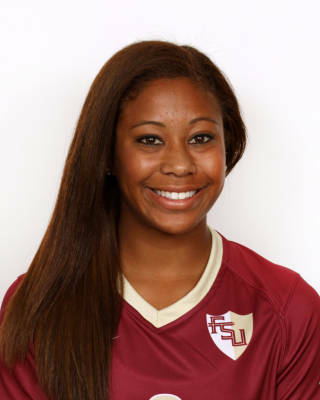 * Assisted on Kassey Kallman’s goal in the 89th minute to push FSU into overtime against rival Florida in Tallahassee. * Delivered an assist to Janice Cayman against No. 3 Maryland, while notching her third assist of the season on a goal by Tori Huster in the 3-0 victory over Clemson. * Recorded a career-high six shots in a 4-1 win at NC State. * Tied for second on the team with six points during the ACC regular season scoring two goals and adding two assists while taking 17 shots. * Two goals against Middle Tennessee State in the first round of the NCAA Tournament served as her first goals in postseason play. * Ten of her 14 career assists have come against league opponents. * Made her first appearance of the season against UAB; started the second half and played 15 minutes…missed the first six games of the season due to injury. * First start of the season came in the ACC opener at home against Maryland. * Finished the season appearing in 13 matches, while making seven starts. * Tallied assists in her first three ACC games in wins over Maryland, Boston College and Miami – notched the game-winner against the Hurricanes…dating back to her freshman campaign recorded assists in six of her last seven conference games. * Assist against Miami made her the all-time leader at FSU for assists in ACC play with her eighth – a feat performed in just 13 career ACC games. * Played in all three games in the ACC Tournament in Cary making two starts…finished the tournament with four shots, one on goal and one assist, while playing a tournament-high 65 minutes in the finals against North Carolina. * Started FSU’s first round NCAA Tournament match-up against SE Louisiana – recorded two shots including a shot on goal in 44 minutes of action. * Brought the Seminoles back from a one-goal, second-half deficit in the third round against Texas A&M…recorded her fifth assist of the season finding Lauren Switzer on a header off a long pass to the far post to even the game at a goal apiece. * Finished the season ranked sixth in the ACC in assists per game (0.40). * One of three Seminole freshmen named to the All-ACC Freshman Team tying a school record set twice before in 2001 and 2005. * Appeared in 23 games making 18 starts while playing over 1,500 minutes in her first collegiate season. * One of three freshmen to play in every game…joined Tori Huster as the only two freshmen to start all 10 ACC regular season games. * Finished her freshman campaign with 10 points on two goals and six assists. * Tied for third on the team in assists and fifth in shots with 39. * Five of her six assists came in league play, tying the single-season school record for assists during the ACC regular season with Sarah Wagenfuhr…went a stretch of recording an assist in three straight games. * Tied for third in assists (5) and assists per game (0.50) in the ACC in conference games only. * Got her collegiate career off to a fine start scoring two goals in 45 minutes of action on opening day against UCF…became just the third Seminole freshman to score a goal on opening day while her point total was the second most all-time among Seminole freshmen. * Recorded a season-high five shots on the road against Connecticut…matched that mark with five shots on the road at Maryland. * Notched her first career assist finding Sanna Talonen for her second goal of the game in the 64th minute against the Huskies. * Tallied her first assist in league play finding Rachel Lim for the game’s first goal in a 3-1 victory over Virginia Tech. * Found Talonen for the equalizer against North Carolina to erase a two-goal deficit on the road against the Tar Heels. * Earned her first career game-winning assist finding Tiffany McCarty for a goal against Miami…finished the season tied for second on the team with three game-winning assists…posted consecutive game-winning assists against Duke and Clemson. * Finished the season starting 18 consecutive games averaging 73 minutes of action during that stretch…played every minute in two consecutive games (Maryland, Boston College) and four overall. * Started all four games in the Seminoles’ postseason run to the NCAA Quarterfinals averaging more than 70 minutes of action during the NCAA Tournament. * Played all 90 minutes in the quarterfinals at Notre Dame – led the team with three shots. * Wrapped up the postseason tournament with 10 shots including five shots on goal. * Pool player for the U-14 U.S. National Team…participated with the U-15, U-16, U-17 and U-18 U.S. National Teams…participated in the U-20 camp in Chula Vista, Calif., in 2009. * Member of the 2009 U-20 squad that played in the 10 Nations Tournament in La Manga, Spain – started all three games for Team USA tallying three points on a goal and an assist…scored the only goal in a 1-1 tie against France. * Led the U.S. U-20 team to a 1-0-1 record during a two-game road trip in Germany in June of 2009…played in both games against England and Germany. * Participated in U-20 camp at the University of Colorado in July of 2009…guided the U.S. to a 2-0-0 record in a pair of friendly competitions against the Canadian U-20 team. * Called into camp with the U-20 squad in Sunrise, Fla., in late December of 2009. * Member of the U.S. U-20 team that captured gold at the CONCACAF Qualifier thus earning an automatic berth in the FIFA World Cup…started two matches for the U.S. playing the full 90 minutes against Trinidad & Tobago and getting the starting nod in the finals against Mexico. * Led the U.S. U-20 squad to the Four Nations Cup title in La Manga, Spain in February of 2010…started two matches, while appearing in all three. * Participated in U-20 training camp in Gainesville, Fla., from March 14-21, 2010, in Carson, Calif., from April 11-17, 2010 and in German in early June in preparation for the FIFA World Cup…registered an assist in a friendly match against the University of Florida. * Member of the U.S. U-20 squad that made it to the quarterfinals of the 2010 FIFA World Cup…started the quarterfinal match against Nigeria and played 65 minutes. * Invited to U-23 camp twice in 2011 – April 24-May 1 and May 15-21 – both in California. * Participated with the U-23’s at the Three Nations Tournament in Falun, Sweden, June 12-22, 2011. * Participated with the Chicago Magic ’89-’90 squad. * Played with the Chicago Red Eleven of the W-League during the summer of 2009. * 2008 PARADE All-American…two-time NSCAA/adidas Youth All-American. * Four-time Illinois state cup champion…former Chicago Tribune Toyota Athlete of the Week. * Top rated soccer recruit in 2008 as ranked by the Chicago Sun Times. * Two-time state champion in the 800m run and a state champion in the 400m dash. * Garnered 4.0 High Honor Roll accolades since her freshman year at Naperville Central…named an Illinois State Scholar. * Named a top 25 recruit by Soccer Buzz. * Daughter of Kerrwin and LeeShelle Short. * Graduated in the fall of 2011 with a bachelor’s degree in criminology and a minor in sociology; completed her master’s degree in sport management in the fall of 2012.